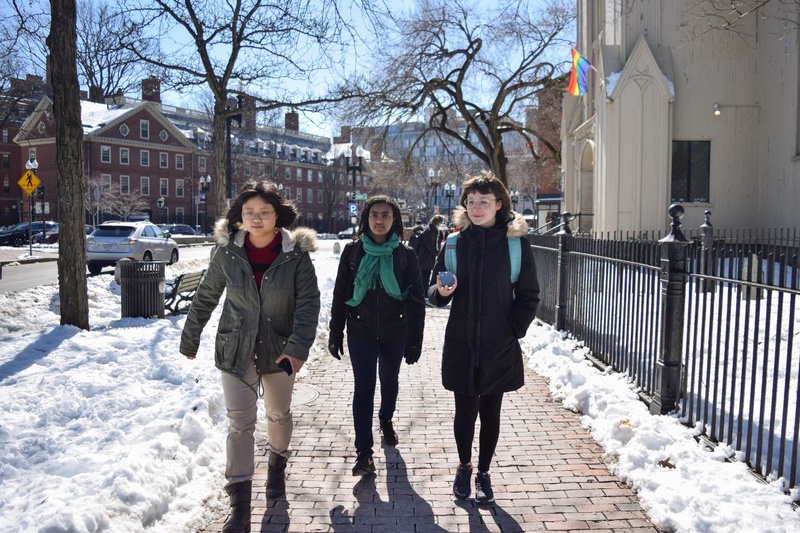 Amanda Y. Su Terry G. Ni ’20-’21 and Luann Zerefa '21 are the founder and treasurer of the Harvard Walking Association. “It makes you feel like you've come a long way,” she says. 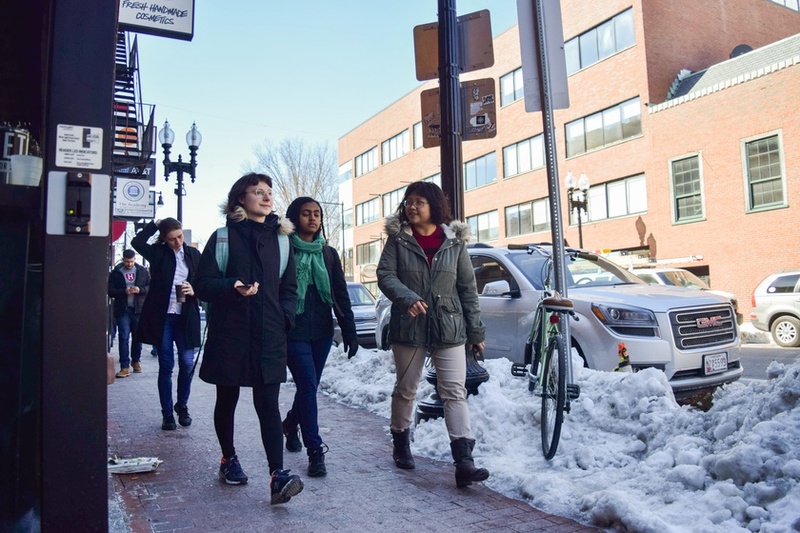 This feeling — one of local novelty — is the aim of the Harvard Walking Association. But only a few decide to take advantage of this respite. Ni later tells me that walks usually consist of three to five people, each walk featuring a different cast. On this sunny Saturday morning, with midterms approaching, it seems that no one else will venture out to join us. Members of the Harvard Walking Association walk through the outskirts of Cambridge, just beyond Danehy Park. The three of us set out on our route. Today, our journey will take us to the outskirts of Cambridge, just beyond Danehy Park, and past the historic Longfellow House on the way back. Each week, Ni carefully chooses landmarks to see and charts the club’s routes using Google Maps. She emails out the itinerary beforehand to members, who often come based on their interest in the destinations. Ni tells me that one of their drop-in participants joined a walk to Central Square so he could have company on his way to work. Another one-time walker was an employee from the Smith Campus Center. Ni enjoys this cycle of company. “A good thing about walking club is that it’s really nice to meet other people who just like walking around,” she says. This has been a longtime interest for Ni herself. “In high school,” she tells me, “I used to walk every day to a new place in Boston.” She enjoyed rediscovering her own city as a sightseer, appreciating quintessentially “tourist-y” places like Faneuil Hall and Quincy Market. A few streets later, we stumble upon today’s opportunity to fulfill the Harvard Walking Association’s mission statement. In front of a yellow-shingled house stands a structure halfway between a cupboard and an oversized mailbox. Behind a tiny glass pane door, framed by white wood and a porcelain door knob, stands an eclectic array of books. This is Charter # 4407 of the Little Free Library. “There are some pretty good books here,” Ni marvels. “Beginning Calculus?” Zerefa replies skeptically, reading out the title of the tallest book wedged into the cubby. “Cat Power — that sounds like something that I would take,” says Ni. Ni explains that there are somewhere near 80,000 of these libraries in the world. Four or five are near Harvard, and one is in front of her own house in Boston. We trek through a park with a baseball field and sledding hills to arrive at our final destination. We look at the sign, marvel at the distance traveled, then turn around and take a different route home.